Step 1 Pare and trim the artichokes, then blanch them for 5 minutes in boiling salted water. Put into an ice bath; when cool, pull out the inner leaves and remove the choke, being very careful to keep the rest of the artichoke intact. You should end up with a cup-like shape. Step 2 Cook the mushrooms, shallots and butter in a large saute pan over medium-low heat until the mixture is cooked and somewhat dry -- about 10 minutes. (This is a duxelle.) Meanwhile, cook the sliced bacon in another pan until rendered; drain the fat and add the bacon to the duxelle. Add the parlsey. In Recipes-list.com we have selected the most viewed recipes from category - Appetizers Sides . Enjoy the best recipes specially selected for you! 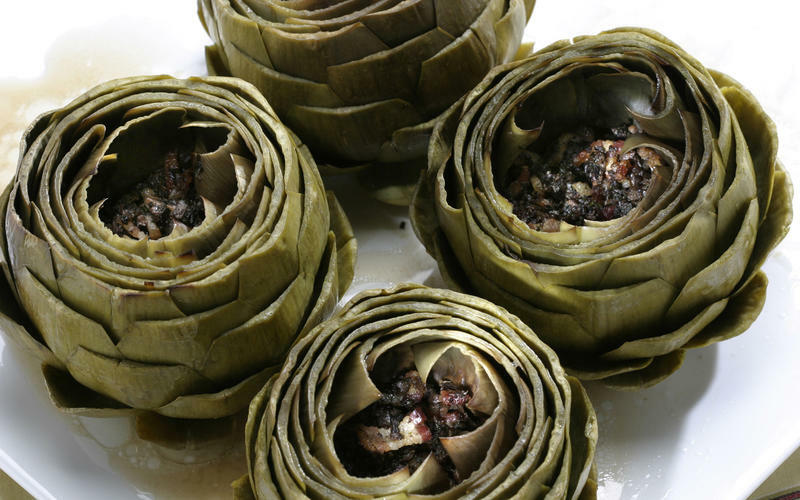 Artichokes barigoule is the right choice that will satisfy all your claims.